Photo: Howard Jelks from the U.S. Geological Survey in Gainesville, Fla., presents his collection of South American Armored Catfish and Blue Tilapia. 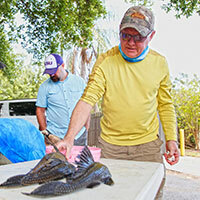 The fish were collected by members of the U.S. Geological Survey, Florida Fish and Wildlife Conservation Commission, University of Florida and others in part of a roundup fanning across Indian River County in search for non-native species of freshwater fish in lakes, canals and rivers. A posse of 35 scientists from nine federal and state agencies, universities and other research institutions fanned out across rivers, canals, lakes and drainage ditches from Sebastian to the north fork of the St. Lucie River Tuesday and Wednesday, hunting and catching freshwater invaders. Using cattle-prod-like electro-shockers, minnow traps, cast nets, seine nets and hook-and-line gear, the scientists collected 11 species of invasive fish that are not native to Treasure Coast waters – trying to get a handle on what species are here, exactly where they live, and how their presence affects native fish such as bass, bluegill and others. "Before you can do any assessment or management, you've got to know who is where. There's no way any one agency can keep track of all the fish in every pond, canal, ditch or lake in Florida So we work together. Everyone pitches in." According to Kelly Gestring, a fisheries biologist with the Florida Fish and Wildlife Conservation Commission who participated in the hunt, at least 34 species of invasive fish are reproducing in Florida's freshwater bodies – many believed to be aquarium pets released by their owners that now compete with the natives for food and habitat. The 11 found here last week are: Mayan cichlid, Nile tilapia, walking catfish, blackchin tilapia, brown hoplo, African jewelfish, sailfin/armored catfish, spotted tilapia, Jack Dempsey, green swordtail and southern platyfish. The Jack Dempsey, green swordtail and southern platyfish were of particular interest because none had been collected here since the 1980s. The Jack Dempsey was caught in a ditch along Indian River Boulevard between 8th and 12th streets in Vero Beach. "Have they not been here all this time and come back, or have they been here and no one's caught them?" Schofield wondered. Last week's fish hunt was the eighth conducted by the Florida Non-Native Fish Alliance since 2013, and the first ever held on the Treasure Coast. Specimens were brought to a check-in site behind a shuttered Wendy's restaurant near I-95 and SR 60 in Vero Beach. After being identified and logged, many were turned over to Robert Robins, ichthyology collection manager with the Florida Museum of Natural History in Gainesville which houses 2.5 million fish of 8,000 species from around the world. The 11 documented species found here are far less than the 23 caught during a previous fish hunt that centered in the Miami-Dade County area – a good thing, according to biologists. "I expected the diversity to be pretty low," Gestring said. "It gets colder up here and these are tropical species." Schofield said all information collected on non-native fish is available to the public on USGS’ aquatic species database at www.usgs.gov.